A publicist in waiter’s clothing, I think. How else to explain the exuberant torrent of details and enthusiastic suggestions unleashed by one simple question: What’s new on the menu? He raves about specific dishes and fawns in general over the arrival of executive chef Jon Blackford. I notice Newport Beach locals claiming stools or settling into tables. It’s sultry outside, but in here it’s as cool and dim as a sea cave. The words “housemade duck prosciutto” yank me back to the moment, but we can’t have it because it’s sold out. We pick a three-item charcuterie plate but only the bresaola is cured on-site. Deep maroon and sliced superthin, the air-dried beef is fine enough, but doesn’t outshine its mates, salumi tartufo and prosciutto San Daniele, arranged on a slate shingle alongside slices of bright chartreuse pickles, cured in-house. Though it never registered on most diners’ seismographs, a tremor shook the restaurant last spring when chef Vartan Abgaryan and GM Barry Pierce decamped to pursue other opportunities. At the helm since June, Blackford isn’t banishing A’s classic dishes—loyalists won’t abide the disappearance of now-entrenched favorites such as spicy yellowtail on tempura-crisped Japanese eggplant, grilled globe artichoke with citrusy aioli, or beef carpaccio with horseradish. Rather, he’s gently introducing new American fare that’s high quality, lifted and brightened with contrasting flourishes or with techniques that value precision over gusto. Blackford’s style is more apparent in the appetizers, but more of his entrées are appearing by the week, now that new GM Tony Motakef is in charge. Charred octopus, and pork belly hash are starters that hint at A’s future. The octopus tastes tender and clean, playing well against fingerling potatoes, red onion slivers, and the tomato-coriander vinaigrette’s spicy acid. Pork belly hash is tasty, a patty of shredded belly and fat, mixed with tart apple and endive. It, too, has a vivid vinaigrette, this time starring grainy mustard. Block-cut New York steak, this year’s “It” cut for beef, gets a nice char yet retains a deep-pink center. It’s a sinewy mouthful, loaded with brawny flavor. Beef shows agreeably again in the tender, dry-aged strip loin, especially if you like the funky, succulent flavor unique to dry-aging. Boned, skin-on trout is crispy, until the fish melts on the tongue. Browned butter imparts nutty notes that also enrich the accompanying swirl of cauliflower purée. Although it’s surely out of season now, the Alaskan halibut is an ample, alabaster slab that looks divine. But it’s served in a wide, shallow bowl on a pool of excellent barigoule, wine-simmered baby artichokes teeming with hearts, which brazenly outclasses the fish. 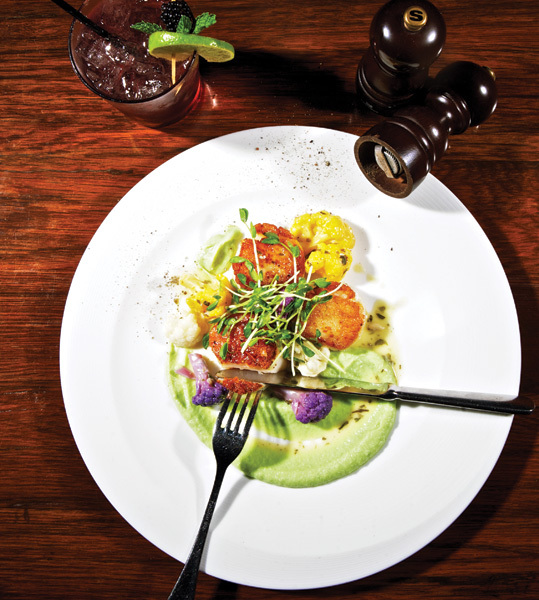 A daily chef’s tasting menu replaces the prix fixe lineup of old. It’s a solid value for highly seasonal cooking in portions that are more generous than expected, since “tasting menu” often is a euphemism for “composed spoonfuls.” Even the entrée, often a choice of seafood or red meat, includes side support from vegetables and a starch. Prime steaks off the entrée menu come a la carte. If you need a side for your beef, overlook the dry macaroni and cheese dominated by intense blue cheese. Instead, try the satisfying sautéed mushrooms, or feather-light hush puppies with jalapeño pepper jelly. Business is steady but mellow at lunch. Office types, predominantly men, huddle over robust fare: mighty Cobb salads, flat-iron steaks and fries, and grilled Gruyère and cheddar sandwiches stacked with braised short rib on chewy country bread. In a nod to The Arches, A’s famous former tenant, the Caesar salad is lemony, light, and snappy-fresh. Batter-fried halibut adds flavor and lightness to blazing-hot fish and chips plated on ersatz newsprint and accented with malted vinegar tartar sauce. Cooked to textbook medium-rare, the signature burger is carefully layered, each bite begging another even when you know you’ve eaten plenty. Desserts are a work in progress. Much-lauded Shelly Register, busy managing A Market next door, no longer is listed as A’s pastry chef, but her recipes are still in rotation. Look for her excellent butterscotch pudding with dark caramel, and the finest, richest black-and-white sundae this side of Farrell’s. Her Valrhona dark chocolate cake is mysteriously intense and buoyant. Or, ask your waiter for suggestions. That garrulous server can’t wait to tell you what’s good tonight. It’s surely a long and tempting list.